enthink: Foundation Suite - Open Text Web Solutions Usergroup e.V. The Enthink Foundation Suite is not just a project template. It is a set of features and tools that are used to build a project. Combining an improved editing experience with a re-designed interface, Enthink built components and a project structure especially for Web Site Management. Page Wizard. Builds new pages quickly and easily in a user-friendly interface. Menus. Re-imagined design and consistency for SmartEdit menus. Parent-child referencing. Allows for multiple sites per project. Quick Actions. Speeds up content creation with intuitively grouped actions. The newly designed Foundation Panel editing interface uses a neutral design theme which is intended to blend with any design project and allows for consistency across all our SmartEdit interfaces. The expanded Foundation Panel highlights the vertical tab groupings of related red dots. The first grouping, Manage Page, contains the red dots for the main settings and content on the page. 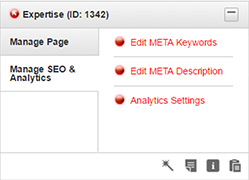 Analytics often requires many fields for configuration, the SEO & Analytics grouping was created to meet this need. Because the user who manages fields may not be the same users who manage content, grouping these red dots separately increases the workflow speed for each type of user. At Enthink, we believe in improving your team’s workflow. The Foundation Panel includes a toolbar with helpful features to enable users to quickly add or find content, page information, manage content and settings, as well as annotate the entire design and build process. 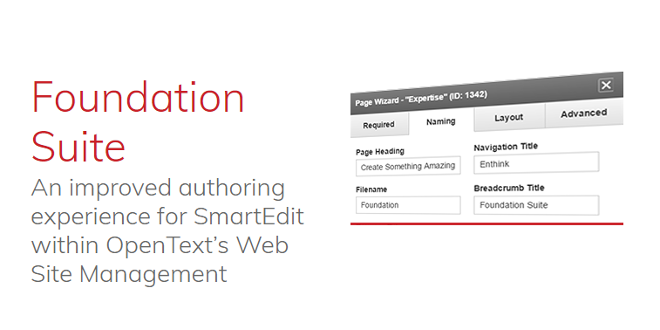 Throughout the lifetime of a project, the Enthink Foundation Suite will drastically improve working inside SmartEdit. We are very excited about to bring new life into your OpenText Web Site Management projects and customizing the suite to meet your individual needs. It is a totally new front end which is clean, simple, less steps, and more intuitive. 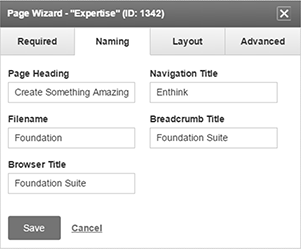 The Enthink Foundation Suite improves the user experience for anyone using RedDot without re-investing in a new CMS. Login to your Resource Center account to watch the Foundation Suite promo and demo videos. If you do not have an account, please register for an Enthink account. Contact Enthink to find out more about how the Enthink Foundation Suite at info@enthink.com.